Rachel Dolezal Howard University lawsuit: Supposedly black political leader alleged she was victim of preference for African-Americans. Howard University campus; Rachel Dolezal. Photo illustration by Slate. Photo by Tyler Tjomsland/The Spokesman-Review via AP, Josh/Flickr Creative Commons. One of the many intriguing questions surrounding Rachel Dolezal, who resigned earlier Monday from the presidency of Spokane’s NAACP chapter, is whether she truly believes herself to be black or has disingenuously adopted a black persona to gain credibility as a political activist. Some insight into that question may be provided by a 2002 lawsuit uncovered by the Smoking Gun, in which Dolezal alleges that Howard University discriminated against her because she was … not black. Dolezal’s lawsuit “claimed discrimination based on race, pregnancy, family responsibilities and gender.” She alleged that Smith and other school officials improperly blocked her appointment to a teaching assistant post, rejected her application for a post-graduate instructorship, and denied her scholarship aid while she was a student … The court opinion also noted that Dolezal claimed that the university’s decision to remove some of her artworks from a February 2001 student exhibition was “motivated by a discriminatory purpose to favor African-American students over” her. Dolezal’s suit was dismissed in February 2004, a decision that was upheld on appeal. The appeal ruling against her indicates that she did not prove she had suffered adverse employment consequences because of Howard’s decisions nor that said decisions were motivated by racial animus. The court noted as fact that the assistantships she’d allegedly been blocked from had already been filled when she applied, that she’d never specifically applied for the instructorship she says she was unfairly denied, and that there was no evidence that Howard had created a hostile environment by rmoving her work from the exhibit in question. 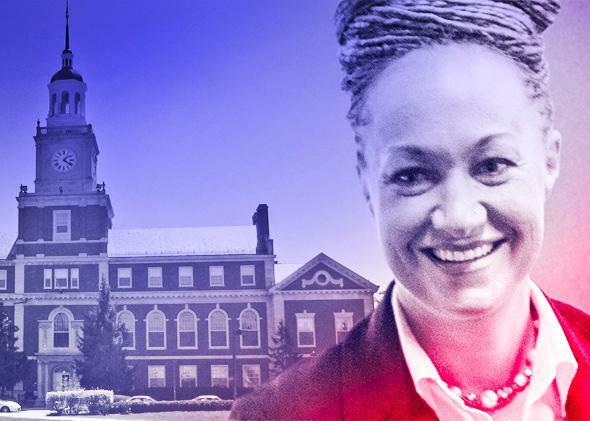 Dolezal graduated from Howard in 2002 with a Master of Fine Arts degree.